The sleek and compact Canon i-SENSYS LBP-6030B mono laser printer in black can improve productivity in the office as well as adding a stylish touch to it. This model delivers high quality prints again and again and has quiet operation, making it a favourite among SOHO-users. With its simple design comes drawbacks, like the lack of an LCD display and limited paper handling capacity. The Canon i-SENSYS LBP-6030B comes in black as opposed to the standard model with white casing. All in all, the i-SENSYS LBP 6030B printer has a neat design. Its paper tray can handle 150 sheets at a time while for output, it can handle 100 sheets. This model has 2 indicator lights and 2 function keys, one of which is the power button. For connectivity, a USB port is at the back. The Canon i-SENSYS LBP-6030B black laser printer has a 32MB memory and uses UFRII LT printer language. 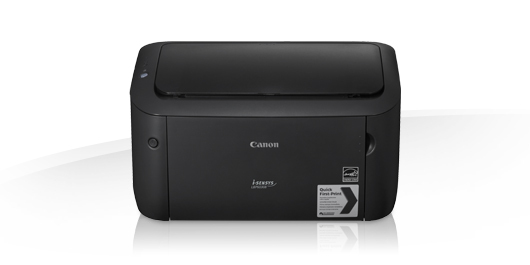 The stylish Canon i-SENSYS LBP6030B black printer takes up little space on desktops yet delivers high quality prints. Print speed can go as fast as 18ppm while print resolution can go as high as 2400 x 600dpi. With the Canon i-SENSYS LBP-6030B mono laser printer, warm-up time and first page printing is fairly quick. What’s more, the robust and reliable Canon LBP-6030B laser printer can handle up to 5,000 pages per month. Optional paper trays for the Canon LBP6030B black and white laser printer aren't offered. The LBP 6030B monochrome laser printer could be shared by multiple users if it had networking connectivity, even optional ones. The addition of Wi-Fi for mobile printing would also be helpful. To help reduce paper waste and improve productivity, an automatic duplexer should have been available.